Long-horizon return regressions have effectively small sample sizes. Using overlapping long-horizon returns provides only marginal benefit. Adjustments for overlapping observations have greatly overstated t-statistics. The evidence from regressions at multiple horizons is often misinterpreted. As a result, there is much less statistical evidence of long-horizon return predictability than implied by existing research, casting doubt over claims about forecasts based on stock market valuations and factor timing. "Pronouncements in the media about how “cheap” or “rich” the stock market or aggregate factor portfolios have become are quite common. These views also creep into the practitioner/academic finance literature. Empirical support for these types of statements originates from seemingly “impressive” evidence of long-horizon predictability of stock returns based on valuation measures. Further, practitioners often document strong levels of statistical significance using overlapping long-horizon returns based on standard errors that they believe correct for overlapping data. The issue is there are few independent long-horizon periods in the short samples used to study markets. Using overlapping returns in the hope of increasing the sample size offers little help. Intuitively, no matter how the data is broken down, you can’t get around the issue of short sample sizes. Therefore, findings of long-horizon predictability are illusory and reported statistical significance levels are way off. A quarter-century of statistical theory and analysis of long-horizon return regressions strongly makes this case. The bottom line is that practitioners need to be aware of these issues when performing long-horizon return forecasts and need to appropriately adjust long-horizon statistical metrics. We show theoretically and demonstrate via simulations that there is only a marginal benefit to overlapping data for the types of return forecasting problems faced in finance. For example, in forecasting 5-year stock returns using 50 years of data, the effective number of observations, from nonoverlapping (10 periods) to monthly overlapping (600 overlapping periods), increases from 10 to just 12 observations. Statistical significance emerges only because reported standard errors (and t-statistics) are both noisy and severely biased. For example, at the 5-year stock return horizon with 50 years of data, the range of possible standard error estimates is so wide to make inference nonsensical, with the expected t-statistics effectively double their “true” value. Applying the appropriate statistics to data on long horizon stock returns and valuation ratios drastically reduces the statistical significance of these tests. 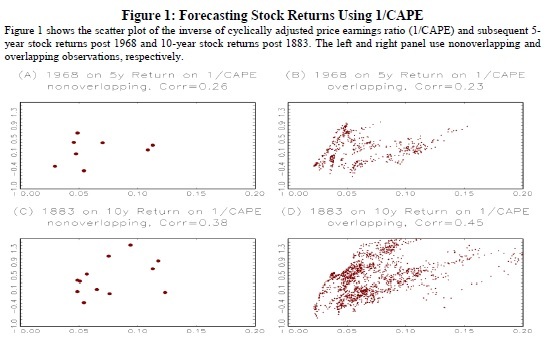 To gain intuition and for illustrative purposes, the left-hand side of Figure 1 shows the scatter plot of the inverse of cyclically adjusted price earnings ratio (1/𝐶𝐴𝑃𝐸) and subsequent 5-year stock returns post 1968 and 10-year stock returns post 1883. Note that the number of nonoverlapping observations is 8 and 12, respectively. The point estimates of the correlations are quite large and positive, 0.26 and 0.38. However, there is very little data to back up these estimates. For example, suppose one were to take away the most outlier point in the plot; the correlations respectively become 0.04 and 0.28. Of course, this finding should not be a surprise. Under the null of no predictability, and putting aside any bias adjustment, the standard error of the correlation coefficient is 1/SQRT(T), which is 0.35 and 0.29 for 8 and 12 observations, respectively. In other words, it is quite possible the true correlation is zero or negative, especially for 5-year stock returns used in the late subsample. In an attempt to combat this issue, practitioners will often sample long horizon stock returns more frequently using overlapping observations, believing they are increasing their sample sizes significantly. Consistent with this observation, the overlapping scatter plots on the right-hand side of Figure 1 are instark contrast to those on the left-hand side and appear to show overwhelming evidence of a strong positive relation. In Shiller’s above example, because 1/CAPE (measured as a 10-year moving average of earnings) is highly persistent, only 2, not 17, nonoverlapping observations have been truly added. To see this, note that standing in January 2003 versus in January 2004, looking ahead 10 years in both cases, the future 10-year returns have 9-years in common. So even if stock returns are serially independent through time, the 10-year return in adjacent years will be 0.90 correlated by construction. Moreover, 1/CAPE itself has barely changed due to its 10-year moving average of earnings and fundamental persistence of stock prices during the period between January 2003 and January 2004. It is these facts that create, by construction, Shiller’s “swarm” effect, visible in the figures. In reality, there is just a smattering of independent data points, 12 to be precise.”"